What is the significance of the Calcium to Phosphorus Ratio? For every milligram of phosphorus you consume, you must consume another milligram of calcium. If you do not do so, then calcium gets taken from the calcium pool of your body – bones and teeth – where most of the calcium in your body is stored, in order to balance the phosphorus. Calcium, combined with phosphate, forms hydroxylapatite, which is the mineral portion of human and animal bones and teeth. Just like omega-6, phosphorus is something you need for many important bodily functions – such as creating ATP (Adenosine triphosphate – the coenzyme needed for energy transfer) and building bones – but it is something that is usually consumed in excess. The excess of phosphorus in today's modern diet is a major cause of bone diseases. It is often overlooked, perhaps because bone health is so complicated. Bone marrow, for example, is generated by your kidneys. The health of your kidneys, therefore, has a lot to do with the health of your bones. In theory, I could draw the conclusion that kidney health is more relevant than phosphorus consumed. However, that isn't the case, because the balance of minerals consumed affects every part of the body, including the kidneys and the bones. Minerals are not proactively absorbed by your body. They are passively absorbed as they "fall" upon mineral receptors in your body. 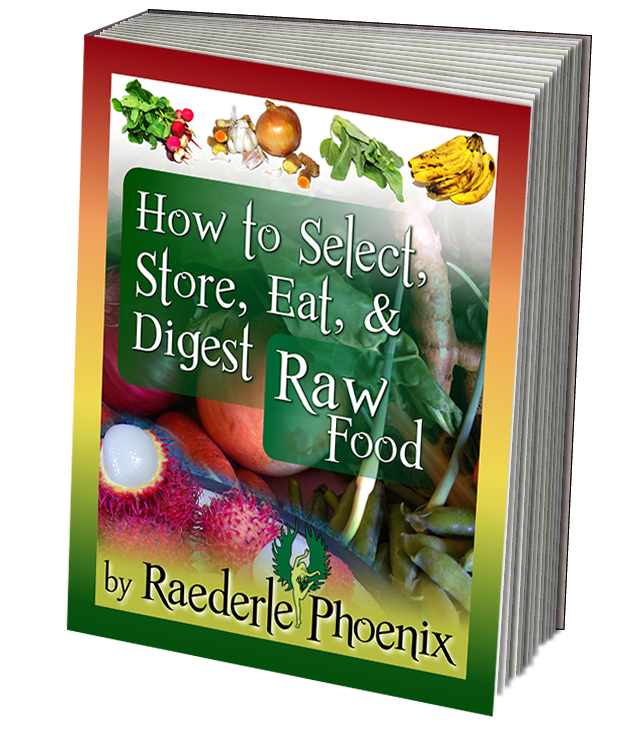 This means that the combinations of food you consume will impact what minerals you receive. Also, the health of the vitamin and mineral receptors in your body will play a major role in what minerals you actually retain. Humans tend to absorb more calcium than phosphorus, so it can be tricky to say whether or not something is “bone building” based on the calcium to phosphorus ratio alone. However, when you stray far enough away from a 1:1 ratio in foods, it is pretty evident if a food is harmful or not when consumed in excess and/or in combination with other foods with similar ratios. When foods have three times as much phosphorus as calcium, or more, that is where it starts becoming a big problem. Nevertheless, the calcium to phosphorus ratio is often entirely overlooked when it comes to humans. Interestingly, we pay close attention to it when it comes to horses. "In horses calcium helps maintain normal brain and nerve function and aids in heart, skeletal muscle, and intestinal contraction. Phosphorus helps regulate muscle and heart contraction, cell integrity, and glucose use. "The calcium to phosphate ratio in the equine diet is important because the two work closely together: "A balanced equine diet must have 0.15-1.5% of calcium and 0.15-0.6% of phosphorus in feed dry matter," Toribio explained. "A calcium to phosphorus ratio of less than 1:1 can have negative consequences on the skeleton." Simply put, a horse needs at least as much calcium in his diet as phosphorus, never the reverse." The strange thing about the above quote is that all of those facts apply to humans as well. So why do we only pay attention when it comes to horses? Perhaps because people feel more invested in money than in health. Horses are expensive to buy, to feed, to raise, and very expensive to help if they break a bone. Despite that humans are just as "expensive" as horses, cars, homes – you name it – often people feel reluctant to pay as close attention to their own health. The calcium to phosphorus ratio didn't used to be as big of a deal as it is now. Phosphorus in the soil and in the foods we consume is on the rise due to pesticide use, and calcium content is on the decline due to over-farming the same soils again and again with calcium-depleting crops. The good news is that you don't have to supplement to get a good calcium to phosphorus ratio in your diet. You do need, however, at the very least, a good chart that shows the calcium to phosphorus (Ca:P) ratio of each food. I hunted for such a chart. I thought, "There has to be one, there just has to be." And yet, and found no such chart. I was astonished that no such chart existed. I decided that I would make such a chart. As I was creating it, looking up the nutritional data for one food at a time and then calculating the ratio of calcium to phosphorus, I became more and more shocked. Several healthy fruits that I ate (at the time) on a daily basis had double to quadruple as much phosphorus as calcium! It's no wonder that even as a toddler my bones would "pop" at the slightest movement and become sore from the lightest bruise... When you consider that as I child I ate a diet loaded with phosphorus but deficient in calcium (and magnesium too!). For example, corn has a shocking Ca:P ratio of 1:45.4 which means that corn has 45 times as much phosphorus as calcium! And we eat corn in everything – high fructose corn syrup, corn chips, corn muffins, corn bread, corn tortillas, chowder, stir-fries, vegetable mixes and more. And wheat isn't much better. Flours, wheats, and even sprouted grains, all contain more phosphorus than calcium. And not just a little more either... Wheat flour (both enriched and non-enriched) has 6.4 times as much phosphorus as calcium (Ca:P = 1:6.4). Whole grain wheat flour has 10.5 times as much phosphorus as calcium (Ca:P = 1:10.5). The question rapidly becomes, "What do I eat?" and "How can I make my bones healthy but still enjoy my meals?" If you already don't eat gluten or processed foods, you're probably not too concerned about the high phosphorus levels of grains such as wheat and corn. But did you know that banana trees are actually a grass (the biggest in the world) and they too have much more phosphorus than calcium? This hit me the hardest! I love bananas! Not to worry though. You can still eat bananas and get more calcium than phosphorus in your diet. Even though bananas have four times as much phosphorus as calcium, there are other foods out there that have four times as much calcium as phosphorus. In fact, I discovered a few magic herbs with as much as 18 times as much calcium as phosphorus! If you'd like to see my Calcium to Phosphorus chart for yourself, and over thirty other incredible nutrition-comparing charts that show you foods in ways you've never seen foods before, then let me introduce you to Vitamin Confusion Solution. Celiac disease is an autoimmune disorder of the small intestine that occurs in genetically predisposed people of all ages. Symptoms may include discomfort in the digestive tract, chronic constipation and diarrhoea, and fatigue. Celiac disease is caused by a reaction to gliadin, a prolamin (gluten protein) found in wheat, and similar proteins found in the crops of the tribe Triticeae (which includes other common grains such as barley and rye). In recent studies on healthy individuals, even people who are not allergic to gluten, and who do not have celiac disease, its been shown that there is still an inflammatory response to gluten. In my ultimate nutrition reference chart guide, Vitamin Confusion Solution, I analyze over 140 different whole foods and give you their Ca:P ratios, organized from best to worst, making it easy for you to choose foods with 1:1 ratios or better. You'll also get charts showing the best sources for vitamins B1, B2, B3, B5, B6, B9, A, C, E, K, Calcium, Iron, Magnesium, Manganese, Phosphorus, Potassium, Selenium, Zinc, Omega-3, and Omega-6. AND, there is even a chart showing you the Omega-3 to Omega-6 ratio in foods, showing you all of the foods that have more omega-3 than omega-6. You'll be surprised: chia seeds and flax seeds are not nearly the only foods with more omega-3 than omega-6. You might be thinking, "I'd love to have this reference guide. But is it enough? How much time will I have to spend looking up foods in the guide to decide what meals are best for me...?" It's a fair question. 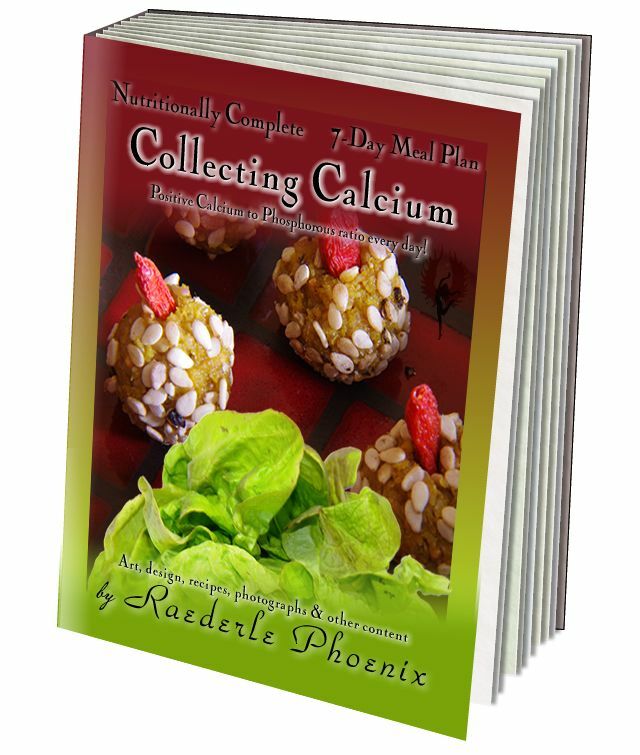 That's why I created Collecting Calcium, a 7-day nutritionally complete meal plan where you get more calcium than phosphorus in each and every day of the meal plan. And, you still get to eat foods that don't have as much calcium as phosphorus, because each day is balanced with foods rich in calcium and low in phosphorus. Collecting Calcium also provides more than adequate levels of magnesium in each day, which is also important for bone health, as well as a good omega-3 to omega-6 ratio (in each day! ), promoting a healthy brain, strong muscles and good digestion. This formula will absolutely help the health of your bones, and for many people, it may immediately begin to reverse osteoporosis, arthritis and other degenerative bone conditions. Some people have even healed small cavities in their teeth! A complete grocery list giving you the exact amount of everything you'll need for the full seven days of the program. Substitution suggestions, allowing for diets that contain no oil, no vinegar, no nuts and/or no seeds. The directions allow for you to include or exclude any of these and still meet your nutritional requirements and build healthy bones. A list of foods that you can eat as much as you want of without ruining the healthy impact of following the program. Directions for how to customize your grocery list to meet the needs of you and your family. Specific timing for how long to wait after each meal before the next meal to allow for optimal digestion, fat loss and muscle growth. Following these specific timing rules will make a big difference in your level of energy. 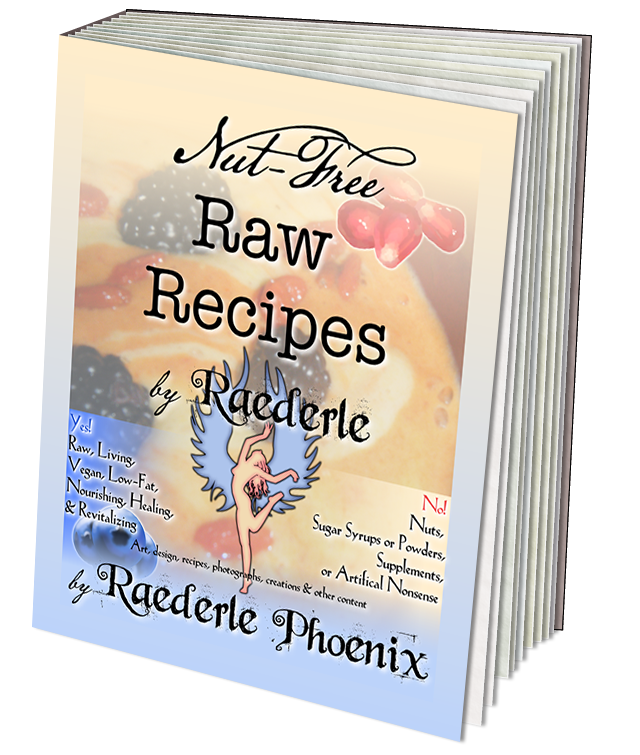 25 recipes including 5 desserts that actually build your bones! 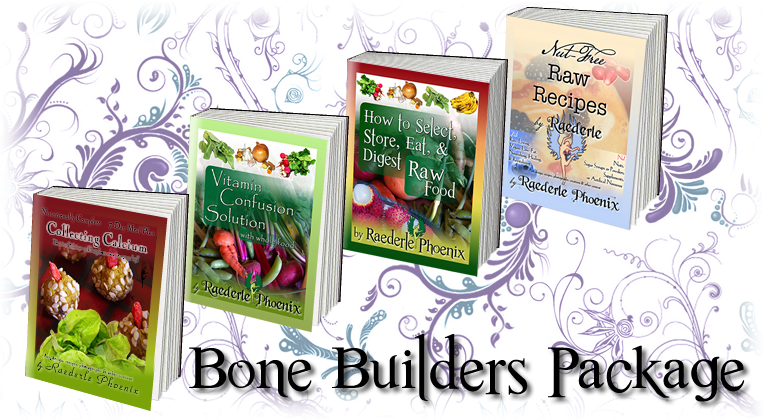 In just seven days of building your bones you'll enjoy Cucumber Tahini Sauce with Flax Nori Wraps, Honey Mustard Blondies, Ginger-Apricot Muesli, Sweet Chard Salad, Garlic Collard Wraps, Banana Ice-Cream (with secret bone-building ingredients that taste great! ), French Marinated Salad, Indian Turmeric Treats, Rosemary Zucchini Medley, and many, many other delicious wholesome meals! While enjoying this delicious, easy-to-follow, nutritious meal plan, if you find that you have any questions, you can e-mail me at any time. I love hearing from you. Your critiques, questions and testimonials are precious to me! If you're ready to stop suffering from bone-related pain and start thriving, then buy Collecting Calcium now. 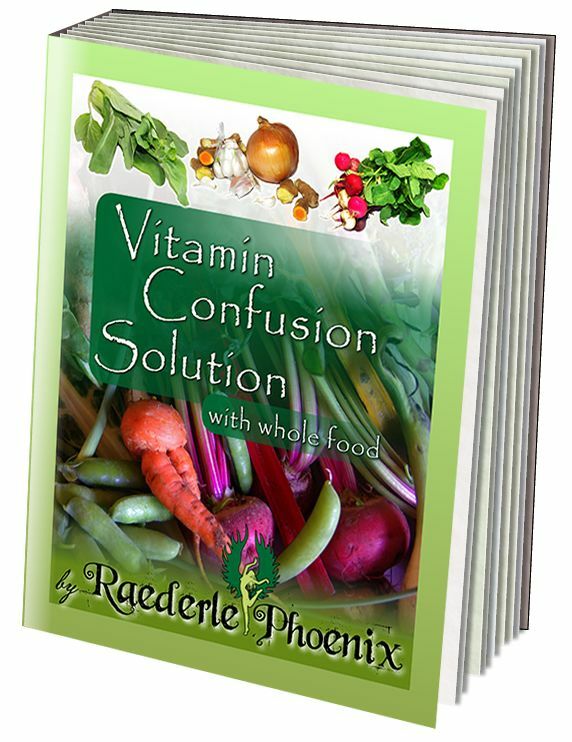 If you want to also eliminate confusion regarding which foods are "high" in what vitamins and minerals and see a full Calcium to Phosphorus food chart, then you'll want Vitamin Confusion Solution as well. You save $63.97 when you buy these together!